The question, posited here last week, is: what mustard, still in existence and marketed nationally, was the first to be sold in the U.S. in prepared form? Falsely laying claim to that distinction is the UK conglomerate that makes French’s Mustard. It does so through a New Jersey public relations firm that claims various distinctions for the product, unbridled by truth. French’s Mustard was introduced at the 1904 World’s Fair in St. Louis, in prepared form—that is, the mustard powder, or “flour,” had already been mixed with liquid and combined with spices, and was ready to use. As I pointed out last week, there were newspapers published well before 1904 which bore advertisements for prepared mustard. Rival manufacturers have not spoken out about French’s false claims. However, Gulden’s, as well as Heinz, have quietly mentioned, through the years, the beginnings of their own products in the 19th Century. Sales were apparently restricted to New York for a number of years. The April 13, 1905 trademark application for “Gulden’s Mustard” showed 1875 as the date when the words were first used in interstate commerce. Charles Gulden and his kin gained various patents on containers for mustard, as well as bottles for other foods including the Guldens’ secondary product, olives. On March 16, 1875, Jacob Gulden, Charles Gulden’s father, obtained a patent on a mustard bottle, shaped somewhat as the glass French’s ones are today. And on July 5, 1881, he was awarded a patent on a “vessel for holding and dispensing mustard” featuring a plunger—still in use on large, commercial bottles of mustard. Charles Gulden on Jan. 30, 1893 secured a patent on a mustard jar cap, and on March 16, 1897, Charles Gulden Jr. was granted a patent on an improvement upon his father’s device. Gulden’s “spicy brown mustard” isn’t brown, these days. It’s a darker shade of yellow than French’s, Heinz or Morehouse mustards, but it, like they, is “yellowized” with turmeric. The American public has cottoned to yellow as the color for mustard. 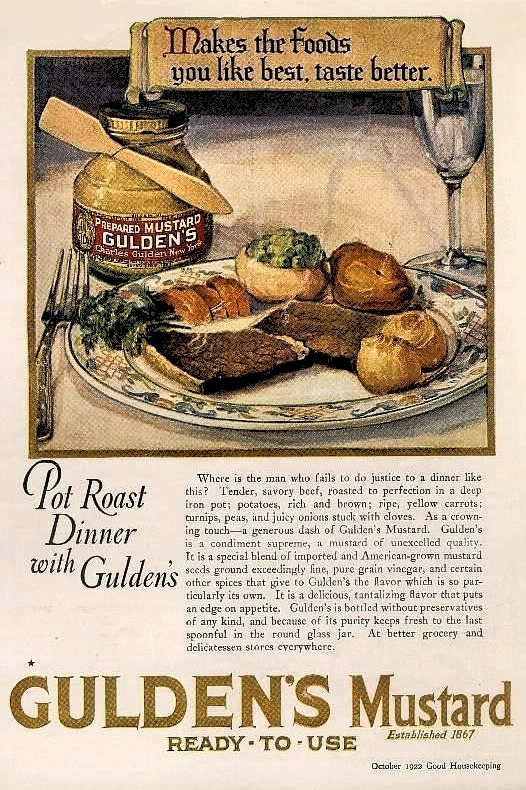 Realizing this, Gulden’s began marketing Gulden’s Prepared Yellow Mustard in 1949, and registered it as a trademark in 1951. Charles Gulden, himself, tried other recipes. The Jan. 24, 1904 issue of the Atlanta (Ga.) Constitution includes a A&P market ad which lists the price of Gulden’s French Mustard at 10-cents. New owners in recent years offered other variations, including a hotter version called “Gulden’s Diablo.” But today, there is only the so-called “Spicy Brown Mustard,” ideal for hot dogs topped with warm sauerkraut, for accompanying polish sausage, or on salami sandwiches.